Sarah Waters is one of my favourite authors, I await each new book with delicious anticipation. 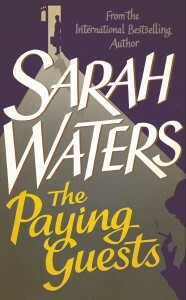 I waited a while for this one, The Paying Guests was a Christmas present and I started reading it about an hour after unwrapping it. I wasn’t disappointed. Waters has written a ‘closed room’ mystery with a bit of romance and crime thrown in, all in the post-Great War context of women’s rights, abandoned soldiers and the corset of social manners. Mrs Wray and her daughter Frances have fallen on hard times, in order to pay off debts left after the death of Frances’ father, they rent out the upstairs of their house to lodgers. Except they don’t call Mr and Mrs Barber their lodgers, they are ‘paying guests’. Waters puts these four strangers together and mixes it a little, waiting to see what happens. They bump into each other on the landing, on the stairs, in the kitchen on the way to the outside lavatory, in their dressing gowns, first thing in the morning and last thing at night. They circle around each other according to the parameters of social behaviour. And all the time, Waters turns the screw slowly, tightening, until the buttoned-down feelings break free. Then all hell breaks loose. I loved this book, the characters are drawn with such care, and I could see this divided house as if looking at a photograph.